“The moment you have an instinct to act on a goal you must [say to yourself] 5, 4, 3, 2, 1, and physically move or your brain will stop you.” When you start to think, your brain wants to pull you right back to the safe familiar zone, so just go and do! The concept of just do it has also been written about by Neil Pasricha in The Happiness Equation but what Mel adds, that I think is really valuable, is the psychology concept of stopping a conditioned response. We can all become conditioned with a trigger and a response. For example, I want to wake up early but I’m conditioned to stay in bed: alarm goes off, I hit snooze. I want to eat healthier but I’m conditioned to indulge: eat one Pringle, eat the rest. So when we pause and say to ourselves 5, 4, 3, 2, 1, we are breaking the conditioned response loop and giving our brain time chose a different response. That’s the key, choosing a different response. In trauma treatment, I educate clients about the automatic trauma response, and then therapy focuses on learning how to identify triggers, slow down that response, and chose a healthier way of responding. The 5 Second Rule is one way of doing that. Mel does discuss in her book how the 5 Second Rule has helped her and many others snap out of their depression, stop their anxiety, and stop worrying. I hesitate here, as a clinician I truly wonder how many of those people reporting success with her rule were actually clinically depressed or anxious, but it clearly has helped many people so I’m not going to automatically discount it. Mel is a motivational speaker and that comes through in her writing. I felt like I was reading an infomercial the first few chapters where they’re telling me all the wonderful things I can have in life if I just learn this one secret, and then only several chapters into the book does she explain what the 5 second rule actually is. Though frustrating at first (just tell me what it is already! 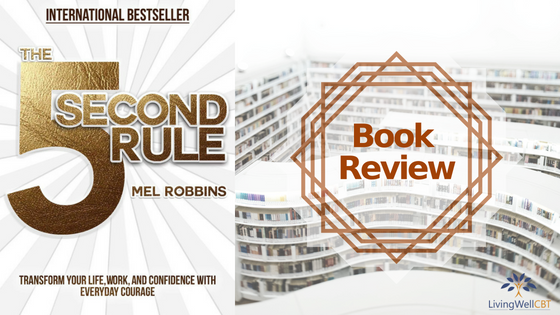 ), Mel does a good job of inspiring the reader that they really can make changes in their life. There are a lot of good quotes throughout the book and some of them are printed large, in bold, on single pages so the reader can tear them out and post them. The book is a quick read, large print, lots of quotes, and a lot of Twitter, Facebook, and Instagram textboxes throughout quickly fill up the pages making the book seem longer than it actually it. This format also places this book firmly in the pop culture self-help realm.